Many Arizona homeowners often find it difficult to come up with front yard garden ideas, thanks to the hot, dry climate in Arizona. 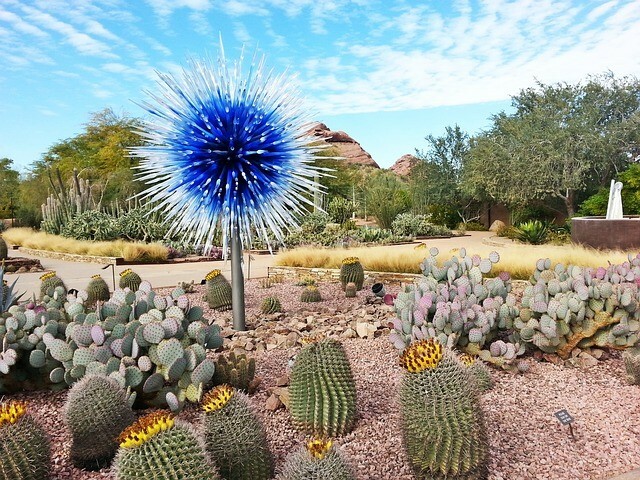 Fortunately, there are many native species of plants that can thrive well in Arizona and do not require a lot of water. When you couple these plants with certain hardscape features of your front yard, you can come up with an amazing and spectacular front yard. Here are some front yard garden ideas that are perfect for Arizona homes. A cacti garden is perfect for the front yard if you don’t have kids. Plant different cacti can make your garden look unique and spectacular. A regal saguaro cactus will survive in the harsh climate for more than 100 years, but also make a bold statement. A prickly pear cactus can lend color to the harsh desert terrain when it bears fruit. While a bearded cactus plant can get your guests talking because they will want to know what the plant is with thin strands of white hair. Select a corner in your garden to plant different cacti species, and then use small rocks to make a perimeter. The space between the cacti garden and the house can be covered with gravel interspersed with medium-sized boulders. Alternatively, you can plant the cacti in the center of the garden to create a focal point. Surround the area with small rocks and scatter gravel inside. You can make your garden a shady oasis, by planting desert trees that offer shade and soothing greenery. Palo Verde is a deciduous that grows well in Arizona and can make your garden come to life with its vibrant yellow blooms. In fact, you can grow this shade tree and grow cacti under its shade. The tree’s foliage will protect the cacti from the harsh summer heat and winter frost. Citrus trees too are common in Arizona. Don’t be afraid to plant orange, grapefruit or lemon trees in your front yard with an irrigation system. Citrus trees require water every seven to 28 days. The lovely fragrance of the citrus blooms can make you forget the heat in Arizona. It will be welcome relief to sit under the shade of the tree in the evening. This is a wonderful front yard garden idea for Arizona. It does not require too much maintenance. Take two-colored landscaping stones and scatter them to create swirling patterns in the garden. In a tranquil part of the garden, demarcate an area to place colored sand. Once you have finished this, place boulders around the garden in clusters. Do not overdo the boulders, as they will absorb heat and make your garden and front room, hot when the boulders emit the absorbed heat. Plant sage bushes and rosemary along the edge of the garden. This will break the monotony and add some color. Create theater-style tiers in your garden, if space permits. Plant cacti and succulents in the terraces. Use small rocks of different colors to create a winding path along the terraces. This will give an illusion of a dry creek. You can plant low cacti, sage bushes and/or yucca trees along the edges of the pathway to add more color and depth. If you like, break the continuity of the edges with small boulders. Use these front yard garden ideas to beautify your Arizona home and also create your own private oasis. These ideas are simple and easy to act upon and you will find it extremely rewarding. For more ideas, check out our article: Top 5 Front Yard Landscaping Ideas.